As I was watching the Little Engineer buzz up and down today’s special layout in his room, I realized we somehow managed to learn about art, biology, planning and executing a project, and gross and fine motor skills, all with a pile of wooden train tracks. If I hadn’t already been excited about the results, that would have done it! This post was originally published on June 22nd, 2012. It contains a link to Amazon.com. If you click on it, we will receive a small commission — at no additional cost to you — on anything you buy at Amazon for a certain length of time afterwards. I was otherwise uncompensated for this post. Read our disclosure policy for more details. United Nations has announced 2011 the International Year of Forests. We have to rethink ways of sustainable forest management, locally and globally. Artificial trees connect us with nature and at the same time awaken creative thinking. Make a Forest is a creative response to the need to preserve and protect forests and a very visible way to explain and support the United Nation’s cause. But Make a Forest is also a tribute to the diversity of our forests. It is a testimony on its everlasting source of inspiration, and its connection to a sustainable future. My interest was sparked simply by the first photo I saw. 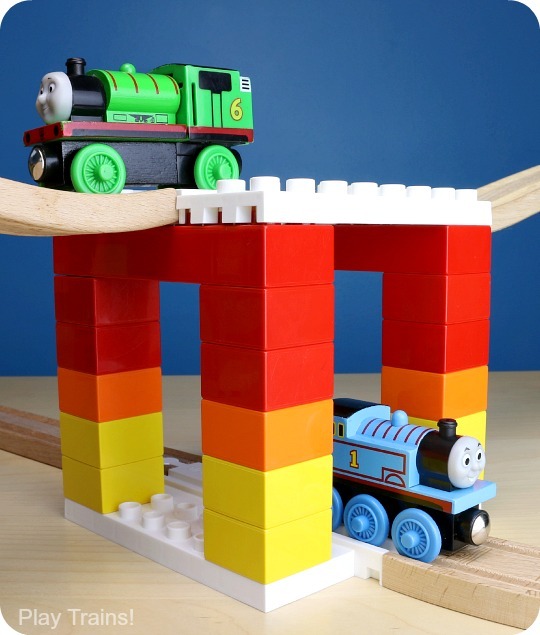 The Little Engineer’s was captured by that video, with the trains assembling at the roots, bringing new pieces of track up the trunk, and disassembling at the top of the branches. I showed it to him a few days ago. When he asked to see it again today, I knew it was time to make our own version. We watched the video a few times. When he was satisfied with that, we looked at the photos on the artist’s website. I told him a little about the origin of the piece, how it was meant to get people thinking about taking good care of trees. I pointed out the roots, the trunk with its four parallel tracks, and the branches to him a couple of times. Then, despite the Little Engineer’s enthusiasm to get started, we took a moment to plan. I made him this “iPad” this week out of poster board, cardboard, and packing tape, a replacement for the less durable one I made him right after his dad got an iPad a few months ago. I drew the shape of the tree/tracks and labeled the parts. And then we rushed into his bedroom and started building. 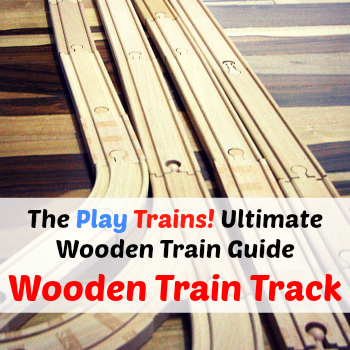 The excitement lasted all the way through building it, with many exclamations of “Tree track! 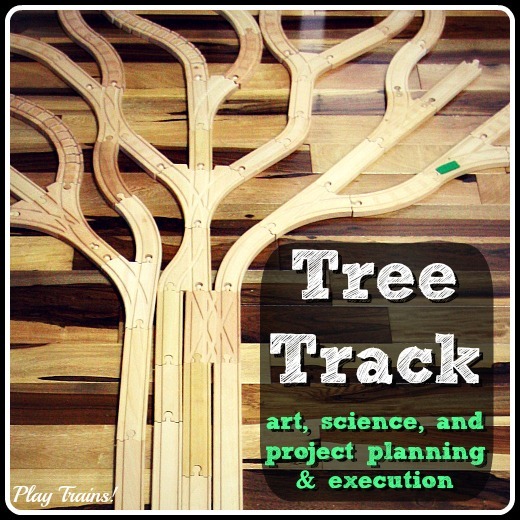 Tree track!” punctuating his running narrative of what we were doing. When he would add a track that just didn’t work, I’d remind him of our plan and explain where we needed the tracks to be straight, and where they needed to branch or curve, and why the tree was shaped like that. At one point, he went over, picked up his iPad, and repeated the words we’d labelled it with. I grinned to myself, and kept building. I really had a lot of fun making it, too. 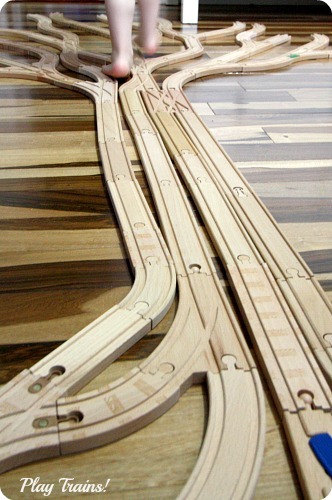 Normally function rules above everything else when building a track layout, so it was lovely to make the long, straight section of tracks, and then the wild curving parts at each end, focusing only on aesthetics. I did take care to join the four straight tracks to each other with split and crossover tracks. 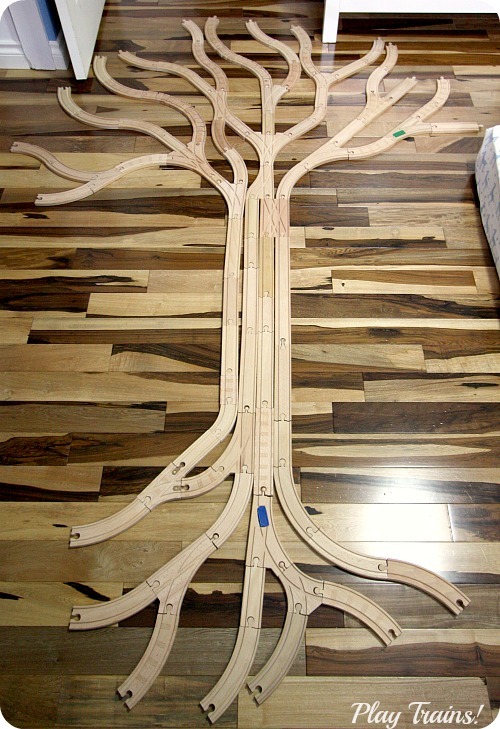 If we build a larger version someday, with all of his track, we’ll have more of the best of those for this purpose to work with (parallel crossover switches like these), so I should be able to hold the trunk together better. As it was, the tracks separated by an inch here and there while we were playing, but it wasn’t anything that couldn’t be easily fixed. When we finished the track, we compared our plan on the iPad to the result and determined that we’d achieved everything we set out to do. “Hooray, Hooray!” he shouted, and so did I. When I first saw the original Tree Track, I had wondered if he’d play with it differently than a normal track. And he did! Something about the trunk made him want to run up and down it, over and over. He also acted out a bit of the video, bringing tracks on these two barrel cars the blue engine was pulling to the ends of the branches and adding them on. As he did so, I talked a little about the roots drew water and nutrients from the soil, up through the trunk to the leaves at the tips of the branches. The interesting thing was he didn’t play trains on it all that much. He was more interested in the track itself and running on it. All in all, this was one of the coolest activities we’ve done together, completely exceeding my high expectations. I’m wondering what else we could do with track to learn about the natural world. This is great! I love all of the connections you were making, and the Tree Track is so cool. Thanks for sharing at the Sunday Showcase! Thanks! My son asks to see this post and the video anytime he sees me working on the blog, so it definitely scored on the cool factor with the kiddo. I love this idea! Sorry, I’ve been bumming around your site, staring at HOW MANY TRAINS YOU HAVE! It’s truly impressive, and my son would adore being pals with yours. 😉 I also like your ideas for snow play, which we have yet to do, and for acting out a story, though I’m not sure we have all of the characters involved. Maybe an abbreviated version…. Acting out the stories is really fun! My son usually will just substitute one train for another that he doesn’t have (there are surprisingly still a few) and call it good. Holy Smokes, this is amazing! My son would absolutely love this. 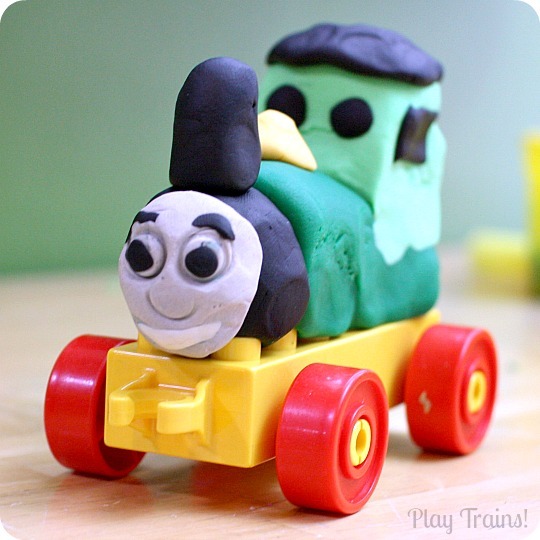 I’m off to explore your blog some more…we are big train fans around here. Thanks for the inspiration! Fantastic! I hope you find more activities that he’ll love! Thanks for visiting. I just wanna know what kind of flooring that is your wood floor is absolutely gorgeous!!! Thanks! My husband says it’s BR111 Macchiato Pecan. We only have it because he used to be the web developer at a flooring company and got a crazy discount! WOW! This is absolutely stunning. 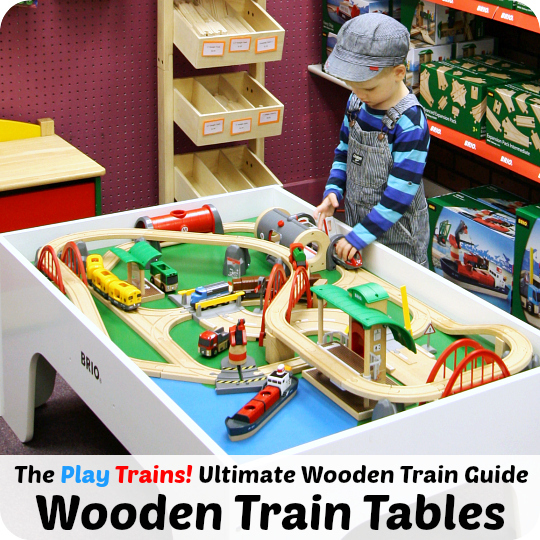 What a wonderful way to combine learning about nature with your love of trains! That is THE coolest track ever!! 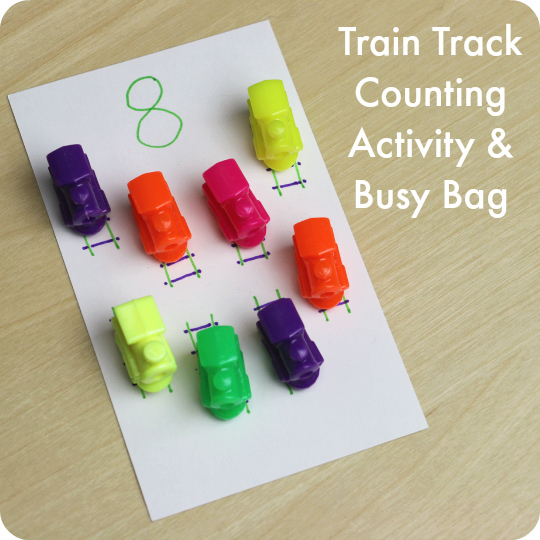 So creative and great way to combine learning with an activity your son loves! This is absolutely fabulous! Thanks for sharing the original video and then how you created such a wonderful fun & learning opportunity for you son! 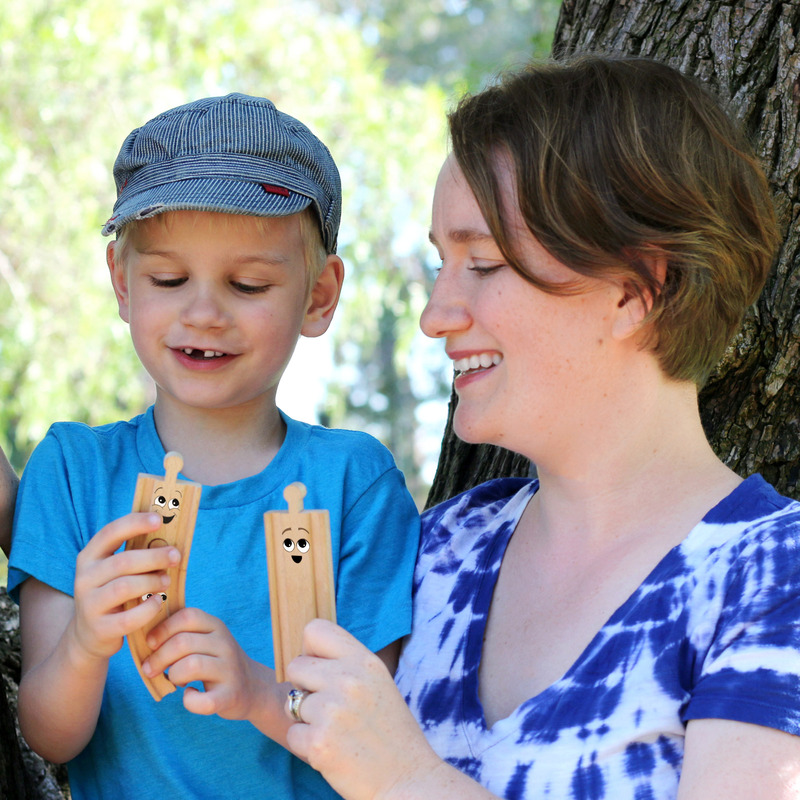 I also like the focus on sustainable wood and I believe that it’s important that we, as parents, look for toys that are made of sustainably grown materials. 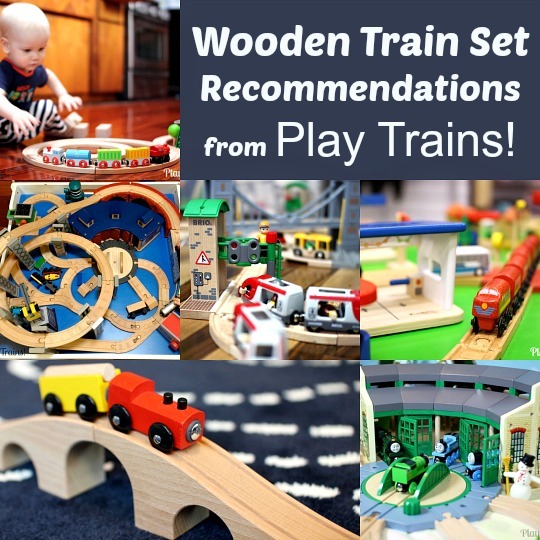 I’m happy to say that Turner Toys carries Maple Landmark’s wooden train track, made of sustainably grown and harvested wood! You know I love this! So creative and wonderfully fun. I’ll be featuring it on The Sunday Showcase this weekend. Thank you for linking up! 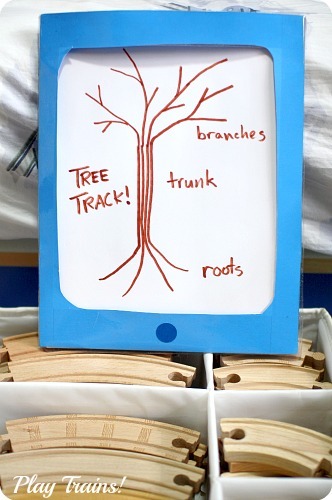 This is such a creative way to learn about trees. Thanks so much for sharing in the Discover & Explore linky. I’m featuring this post today. I am in love with the tree track! I saw it on Pinterest and had to see more. Wonderful post. We are going to have to have a go. 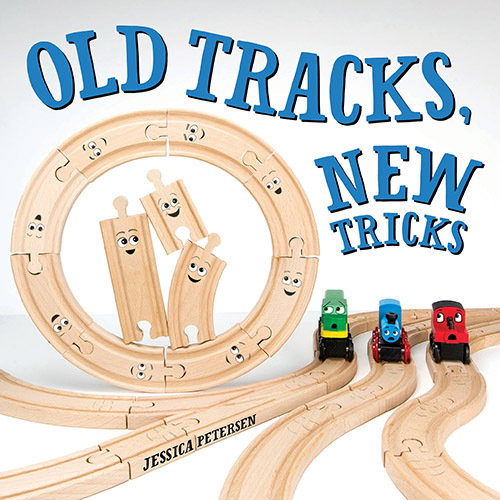 Hello I was just wondering if to make the tree track you used all the tracks from one wooden train set or if you combined the tracks from different sets. 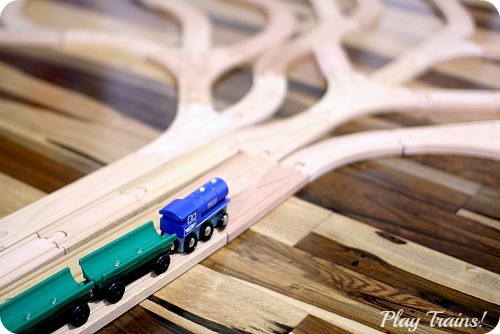 Surely, the wooden tracks from one set is not enough to make the entire tree?